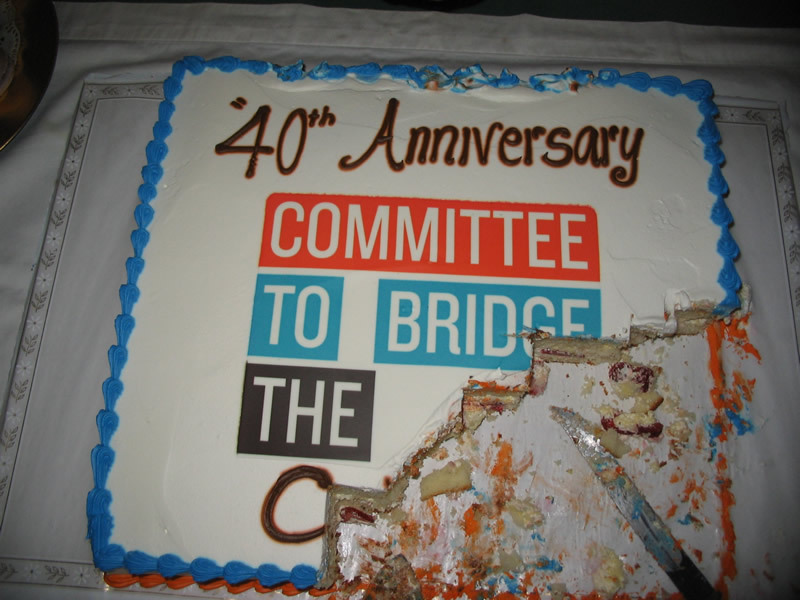 Attending Committee to Bridge the Gap’s 40 year celebration June 13 brought full circle a dozen years of environmental reporting that has often been aided by the facts and leads provided by CBG’s Daniel O. Hirsch. The occasion attracted leading California and national environmentalists including California Assemblymember Julia Brownley and her chief of staff Louise Rishoff. Brownley told tales of her visits with Hirsch to each officeholder to explain to why they should vote for Senate Bill 990 requiring that the Santa Susana Field Laboratory (SSFL) be remediated to the strictest standards. The crowd also included Sierra Club California’s director Bill Magavern, Joe Lyou of the California Environmental Rights Alliance (and former CBG executive director), Alliance for Nuclear Responsibility’s David Weisman and Diane D’Arrigo, Radioactive Waste Project director of the Nuclear Information & Resource Service who flew out from Washington D.C. especially to attend the festivity. And accompanying me, naturally, was EnviroReporter.com’s Denise Duffield. Duffield is also the associate director of Physicians for Social Responsibility – Los Angeles, a Nobel Peace Prize-winning organization that first informed this reporter of the Santa Susana Field Laboratory issue in 1998. I saw friendly faces that have filled stories of suffering and struggle in my reporting over the years. People like the “Rocketdyne Ladies” from the Santa Susana Knolls neighborhood which is less than two miles downhill from the lab. Holly Huff’s home has one of the creeks running right through it. Barbara Johnson, Marie Mason and Dawn Kowalski round out these friends who make up the Rocketdyne Cleanup Coalition which began in 1989. Johnson and Mason serve on the Santa Susana Field Laboratory Work Group which holds EPA-funded community meetings on the lab’s cleanup quarterly in Simi Valley. Of course, it was delightful to see so many folks that I have known since 1998, people who put people first like Margery Brown, Jeanne Londe, Barbara Johnson’s husband Lee, Bonnie Klea’s beau Walter and PSR-LA board member Dr. Jimmy Hara. I saw folks whose names escape me but whose resilient energy was so familiar. These Americans are part of Denise and my Nuclear Family. It is quite possible that none of these folks would be at this celebration and concert if it weren’t for another attendee, Michael Rose, who was largely responsible for discovering in UCLA papers that a meltdown had taken place at the lab in 1959. Rose brought his discovery to Hirsch and the fireworks soon began. That description doesn’t do justice to the monumental work that Hirsch and CBG have done over the last four decades. The shutdown of the UCLA reactor which, unbelievably, had an art collection on an easily-accessible gang plank surrounding the reactor core, led to the adoption by the federal Nuclear Regulatory Commission of rules that converted research reactors here and abroad from weapons-grade highly-enriched uranium to non-weapons grade fuel, preventing future theft or diversion of the powerful and dangerous nuclear material. Hirsch, CBG and the community were responsible for shutting down the Santa Susana Field Laboratory’s nuclear facility which housed ten reactors, a “hot lab” for cutting up reactor fuel rods brought in from around the country and a plutonium fuel fabrication facility. The lab is perhaps best known for the partial meltdown of the Sodium Reactor Experiment in July 1959 which, by several estimates including those of EnviroReporter.com, released hundreds of times more radiation from the uncontained reactor structure than the more infamous meltdown of Three Mile Island in 1979. CBG disclosed and ended American plans to place in orbit nuclear reactors and bombs to fuel “Star Wars” armed satellites. Hirsch also got national and international dumping of radioactive wastes in the oceans banned. CBG forced the shutdown of the Hanford N-reactor which ended nuclear weapons plutonium production in the United States. The group helped force the Nuclear Regulatory Commission to require nuclear power plants to be protected against truck bombs. And, with other allies, CBG was instrumental to defeating the proposed Ward Valley nuclear dump which would have sat open in the desert a few miles away from the Colorado River. A few years ago, Hirsch told me that his only major failure was in not being able to stop a park, and eventually a dog park, over a biomedical nuclear and chemical dump in Brentwood on Department of Veterans Affairs land. Indeed, Hirsch’s VA nuke dump story is astonishing. Praise for Hirsch began with CBG board chair Susan Clark. A new generation of activists was represented at the event by a group called Teens Against Toxins who had a bake sale for Boeing. A video of the tongue-in-cheek event was screened, earning a roar of approval from the crowd. The celebration included a concert by Amanda McBroom, a multi-award-winning songstress who has been called “the greatest cabaret performer of her generation, an urban poet who writes like an angel and has a voice to match.” McBroom, perhaps best known for penning Bette Midler’s worldwide number one hit “The Rose” in 1979, gave a sparkling and moving performance dedicated to Hirsch. It is no wonder, especially after being enthralled by this talented artist in such an intimate setting with an especially special audience, that McBroom has had her songs recorded by the likes of Leanne Rimes, Harry Belafonte, Judy Collins and The Manhattan Transfer. These are indeed troubled times for the Earth and her inhabitants. We face unprecedented threats of such magnitude and complexity that it would be far easier to turn away, to ignore that inner voice that tells us something is wrong, very wrong. But people like Dan Hirsch and Committee to Bridge the Gap have never given up and never will. Why? As I was reading about the accomplishments of Dan Hirsch and CBG I wondered, what if they had been like everyone else who meant well but were ultimately defeated by either the powers of pollution or by public apathy or simply had become burned out by boredom. What if Dan Hirsch had been just like the rest of us? Scary, huh? I moved to Simi Valley when I was 2, in 1964, my house was built in 1961, each side of the street had either orange or walnut trees in the back yard. These were full grown, from the original groves. So they didn’t move the dirt. Within 5 years of moving there, I remember them tearing away the mountain for houses and Hillside Junior High School, which I went to. I imagine all that dirt went somewhere, probably to finish the 118 on the other side of the valley. Neither my brother or I could have children and had to adopt, my sister’s 1st child died at 4 mths of SIDS, my father is having serious issues that I believe is caused by this and I have Fibromayalgia. If I knew what they were testing for it might help my dad. Who is responsible the DOE, NASA, Boeing, the federal state or local governments. I read your article four days ago and was completing shocked to find out the supposed rocket testing site, (where I could see the fire on the mountain, feel the shaking and couldn’t hear anything), was an experimental nuclear reactor without a dome. I am leaving my phone number 760. [redacted by editor]. All of us have our class pictures from school, people must be notified, most people left and are all over the country now. I would guess that at least 30-40% of houses built in Simi were built between 1960 and 1964. I don’t believe they removed the dirt prior to 1964. My address was [redacted by editor] Daunet Avenue, which is within 1 mile of the old Runkle ranch. Is the EPA’s report that is due Spetember 2011, a report on testing or is a report explaining what they want to test? What are they going to test for? What options do we have – rely on a broken healthcare system and government institutions that move at a snails pace hoping we will all die?